The 2014 Taooibg World Summit has come to an end. WHat apowerful event. I cannot wai to apply everything I learned or that I was reminded of. And I am commiting to tapping every day. 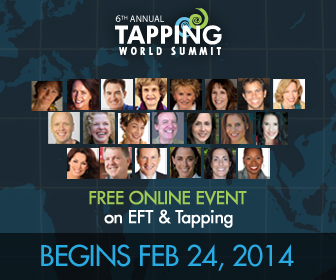 If you have missed the Tapping World Summit, you can sill purchase the recordings. Below is my review fro days 8 to day 11. I loved this interview, It was fascinating. I did not know about Paul Scheele work so Now I started to research. I love what he is doing. But not everybody is into the metaphysics. People find a spiritual emptiness in their lives. Before we come to this life we know our purpose. So we have a purpose, but when we are born we forget it. The thing we fear most is our life purpose. Life will present you with opportunities to discover your life purpose. But if you set goals you might miss it. We do not fulfil our life purpose during our lifetime because we set goals to attempt to fill that emptiness. The idea of living wholeheartedly is aligning ourselves with our life purpose. Apply psychological reversal to your goals. He did rounds of tapping to discover your life purpose. This session was mainly to overcome frustration of being in physical pain, but can be applied to overcoming any frustration. Rick Wikes explained how our primitive brain worked. We may react according to our primitive brain, but tapping helps you realize that you are now safe and respond in different ways. Healing occurs when we reconnect. Everything is energy and the poin is to redirect that energy in a positive way. When tapping do not worry about words. Tap and say what you feel you nee dto say, or just go on feelings. Tapping means being honest with yourself. What big secrets are you still hiding? It is important to relate to your body. You do not need to fix it Just relate and accept it. Tap like you floss and brush your teeth. You need to do it daily. This was an inspiring interview. Lori Leyden , has helped thousands of people in Rwanda to overcome post dramatic stress disorder. She taught them to tap, and the people there has responded so well. The have taken it in their hands and started tapping. The deepest wound they wanted to overcome was the wound of being an orphan. After the Sandy Hook shootout Lori joined forces with Nick Ortner to tap with all the people that have lost their children and with the city itself. The interview was not much about tapping rounds, but how they are using tapping to change the world and how you can also do the same. But to help others you need to help yourself first. Use EFT to heal your wounds so you can help others. Tapping can calm brain function or accelerate it. Depending on the type of sport you can decide which part f the brain you wantto calm down. Dr Shannon explains how she uses tapping with athletes. If you need to play sport, besides practicing the actual sport, do EFT. Tap before a game. She says the most important thing to remember is to be in the zone . The zone is this moment Past and future are not the zone. IF you are not in the zone you will be anxious. If you can live your life all in, the problems will fall away. This is not only about sport. Live your life being present. As Dr Shannon said it, everything is energy, and we can use that energy positively or negatively. Steve Wells says that most people think only about the fear of failure, but many have a fear of success. Failure is a projected image of yourself in the future. Most people prepare for failure but not for success. The fear of failure comes from our past failures. With regards to success, people do not feel comfortable being successful. Until you are not comfortable you will not be successful. Thoughts alone do not have any power. The problem is when the thought goes with a feeling. Connect with success. Look at success more realistically Get around successful people and let them transfer their feelings and emotions to you. Remedial process Tap on objections and blocking beliefs. When you have a goal, have an image of the goal, and start taping on how you would feel once the goal has been achieved. Gwenn Bonnell says that self acceptance and self love is such a problem that people have trouble saying the statement when tapping . Accepting that there is a problem is the first step to healing. You have a critical part and a loving pat that need to communicate. There I sno good or bad energy, just disruptive energy. Get the energy flowing by tapping. The answer is always inside of you. Give it a chance to flow. It is all about being aware and making choices.. Accepting yourself and accepting situations. Mirror exercise: Look yourself at the mirror and say “I accept and love myself”. If something comes up when saying it, then tap on it. Tap, even when not knowing what to say. Very powerful session for me as I struggle with self love and self acceptance. The key is to tap it every day. Jessica Ortner has been the host of the summit. To end the summit she did a powerful tapping round to integrate it, and she did the peace procedure, inviting everyone to tap for 40 days. This entry was posted in Tapping. Bookmark the permalink.